I have been keeping tract of the bows we sell in our store for a while now. My sample is quite large but only representative of my store, not the market as a whole. I am including these statistics in my blog for a few reasons. Primarily because it is just interesting to see for your own reference. If you are a bow maker it is handy information. Since most of our customers are hunters, it is interesting to note that they chose a length of 61.10". A nice compromise between shootability and maneuverability. Not long ago quite a few people shot bows of 60# and up (only 8% of my customers today!). It took a while for people to realize that elk sized animals can be consistently and reliably killed with lighter bows. That old school mentality still exists among certain people, and can hurt a bowhunter's confidence in buying a light bow (when I say light I mean relative to what used to be normal, so in this case, 50# is "light"). I want a customer with a 50# bow to feel confident, knowing that he is not alone in his choice of bow weight. If you are looking at selling your bow in the winter months, and are discouraged that nobody seems interested, it might be worth noting that their isn't as much demand in those months. These stats do not include kid's bows, or "beginner" bows like the Samick. The vast majority of all bows sold in this study were sold to hunters as opposed to target shooters (my observation). Only 3% of the bows we have sold have been under Colorado's legal hunting weight limit of 35#. 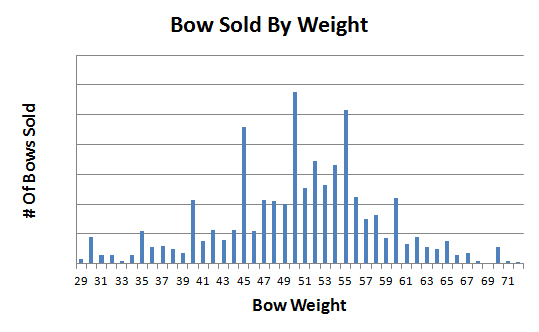 Average weight = 50.25# @ 28"
The other 32% is a mix between other production and custom bows. Note the spikes in the graph in 5# increments at 40#, 45#, 50#, 55#, and 60#. Except for those points the graph is a pretty nice bell curve. The below percentages might be more relevant. By far the most common weights are from 46-55#. 51% of all bows we sell are within that range. Guys who shoot bows over 60# are only 8% of our market. The first year I kept stats I did not include Jan. and Feb. (though they are still the slowest months). This graph is not a fair representation for that reason. 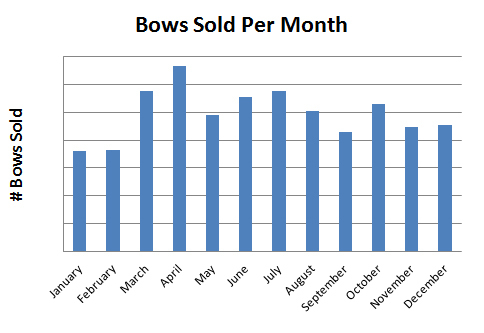 Recently Jan. and Feb. look close to Nov. and Dec. April has sold more bows every single year except 2011, where it was a close second to March. In my observation, tax returns often get spent on luxury items, like bows. I believe that is why April sees such a big spike in sales which then drops off quickly in May. Throughout the summer, when people are shooting more, they buy more bows. Peaking in July and tapering off as hunting season approaches. Sales regain speed when the hunting season ends. Here in Colorado, September is the most popular bowhunting month. I would assume that the monthly graph would look quite a bit different in "whitetail" states where October and November are the most popular bowhunting months. It is cold in Jan. and Feb. and not many people are outdoors shooting. I think customers buy fewer bows in those months because they aren't shooting as often, and bows aren't on their minds. Once spring rolls around, turkeys start gobbling, and people take to the outdoors to shoot, they start buying more bows. Buyers are heavily influenced by local forces. Colorado buyers like to support Colorado bowyers. I have sold many bows made by local bowyers simply for that reason. Also, there are forces within specific regions of the state that also effect bow sales. For example, in different parts of this state different bows are more or less popular. You can imagine how different separate parts of the country would look! We sell more Spirit bows than anything else. Bryan Holley, the bowyer, builds mostly 1 piece longbows at 62". His bows are built very well and priced extremely fair. He also makes them readily available. These reasons combined equate to us selling a lot more of his bows. That skews the average length to be closer to 62" and increases the percentage of both longbows and 1 piece bows. I think (again, only my observation) that the market as a whole shoots more recurves than our stats represent, and more takedowns. Then again, Bryan does these things because he has a keen understanding of what the market desires...Are Spirit bows an anomaly based on availability and price point? Or is this what the market really desires? I suspect it is a combination of both. Most of our customers are primarily elk hunters. Bow weight seems to be of more concern. In a state where whitetail deer are the primary target I think that the average weight would be at least 2-3 lbs lighter (my observation). Please read these statistics for what they are. One sample of the market based on the business I do here in Denver, CO. I do not wish for these statistics to be read as a popularity contest between bowyers or bow designs. These numbers don't lie, BUT they only tell a very small part of the story. There are only two things I feel are slightly indicative of the market in whole. 1) Bow weight. Even that is skewed by local demand for local purposes. And, 2) Average cost per bow. But that must be also be weighed against local incomes and local demands. I do sell quite a few bows out of state, which is why I think cost might be kind of relevant to the market as a whole. We here at the shop all do our very best to remain as objective and neutral as possible with our customers. I do not believe that I am doing a customer justice by recommending a certain bow to him. We are very conscious of allowing the customer to shoot as many bows as he can, and to then make up his own mind based on his own criteria. Now obviously we have the most experience with the local bowyers that we represent, so when concerns over warranty or stability arise, we can answer with certainty about the bowyers we have dealt the most with. I know that impacts sales, leading to more sales for local bowyers, and less for bowyers in other parts of the state. Of the out-of-state bowyers that I deal with, the longer we carry their bows the more we sell for these same reasons. So, while I realize that our personal opinions do persuade buyers, it is of minimal amount. We let the bows do their own talking. Any discussion of our own personal opinions are tempered by our encouragement to the customer to decide themselves by shooting various types. I don't sell a significant amount of other styles of bows to even make a blip on my statistics. Horse bows and self bows are the two other most popular styles that I sell. I perused my list and could not find enough of both combined to account for even .02%. In sum, I feel that this can be an interesting read if you like this stuff, with some useful information to bowyers. How it pertains to the entire country or other shops may or may not have relevance. Thank You for taking the time to compile the stats and produce a very interesting report!